TUCSON -- Self-improvement books are stacked on Mike Stoops' desk. One of them might even change his life. It's a book authored by former NFL coach Tony Dungy, and it has become a topic of conversation at his weekly Bible study meetings. "Doing what we do, and how he did it, is really unique," Stoops said. "We're all dumbfounded by it. How he can be so . . . "
"We're trying to learn how to do it that way," he said, smiling. "But it takes a lot of trust." 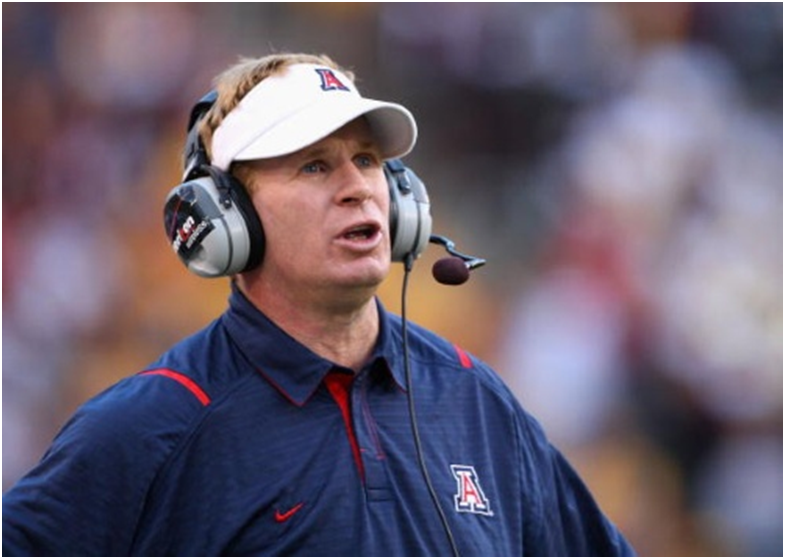 Over the years, much has changed with the football coach at the University of Arizona. He no longer is perceived as the little brother riding a big surname, a smaller piece of fruit on a giant coaching tree. He just beat one of the smarter coaches in the Big Ten and has the unbeaten, 14th-ranked Wildcats poised for a magical season. He has become a coach of serious substance. But his sideline antics still are commanding all the attention. "I love him," said former Wildcats star Antoine Cason, now a member of the Chargers. "He's a fiery guy. He's animated on the sidelines. He's in our corner, and guys respond to that." Arizona's 4-0 start has come at a perfect time for a sagging city, where the departure of Major League Baseball has left a big void. Recent data from Nielsen Media Research indicates that people are leaving, too. The Tucson market has shrunk by nearly 4,000 television households in the past year, dropping one slot to the 67th-largest market in the U.S.
By contrast, the Phoenix market gained 10,000 households and remains 12th in market size. Yet Stoops' Wildcats now are a local treasure, and you can see the pride on game days, when the community gathers to walk with the team on their way the stadium. "We're doing everything we can to stimulate the environment over here," Stoops said. "But I was a little apprehensive about the Cat walk. I didn't want people throwing stuff at us, and two-three years ago, I don't know how well that would've gone over. I don't want to get stomped." Ah, but winning can do wondrous things. For proof, consider Stoops' demeanor. When things are going well, his game-day intensity is celebrated. When the losses mount, the histrionics suddenly become problematic. It's part of the vortex of pressure in which football coaches operate, and it drives Stoops insane. "The focus should be on our players and their intensity, not mine," Stoops said. "If my players didn't respect me and the fans didn't engage it, then it would be a problem. But I give it everything I have every time I step on the practice field. And every time I'm in a game, I'm prepared. That's all I can do. I can't be somebody I'm not." Yet he still finds himself gravitating to Dungy's book, "The Mentor Leader." Maybe Stoops can become something he's not. Maybe there's a better way. But should he change? And could he have revived a dying program without that bug-eyed, vein-popping intensity? Probably not, but here's the rub: The sideline sideshow occasionally turns him into a caricature of a coach, and as a result, some people miss the true essence of the man. "It's not about me. It shouldn't be, it's never been and never will be," Stoops said of his core strengths. "It's not about financial gain. It's about being humble. It's about competition. It's about pride, overcoming all obstacles. It's about toughness, not backing down. And it's about being a family. My players understand how important my family and kids are. "You can't fool your players. Don't ever think you can, because you can't. They know what you're about. They know everything." Like Dungy, it's admirable that Stoops is exploring non-traditional approaches to football, a business in which stress kills and priorities become easily distorted. He knows his own father Ron died from a heart attack at age 54, the night after coaching a high school football game. There are lessons to be learned here. But there's also a game against Oregon State looming, and a precious chance to lead Arizona to its first Rose Bowl appearance in history. No time to ease up now. "Good to great is a hard step to make," Stoops said. For a coach who has put in some hard time, it's the only step left.